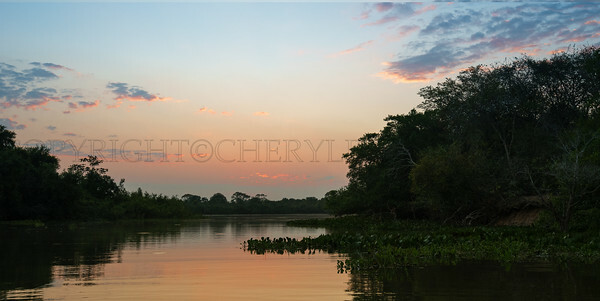 The Reserva Ecologica da Guapiacu (REGUA) is a not for profit reserve focused on re-foresting the Atlantic Rainforest. It is a lovely spot with devoted people. This was taken from a tower built for viewing the surrounding country side. 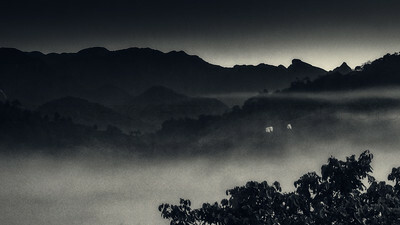 The mountains were often shrouded in mist or ominous purple and gray clouds. In the mornings flocks of egrets flew past in large numbers. 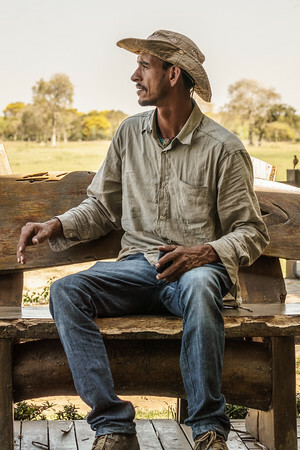 A Pantaneiro is a sort of Brazilian Cowboy. 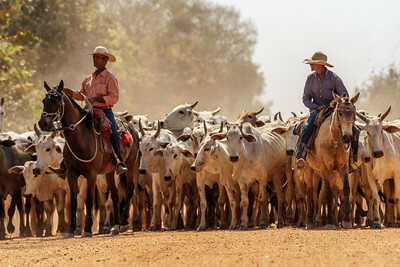 The word Pantaneiro also refers to a breed of cattle brought to Brazil by the Spanish over 300 years ago. The Brazilian ranches drove de-forestation in Brazil, but they are now working hard to protect the rainforest. As guests we had almost zero contact with the Pantaneiros and herds of cattle and horses. The visitors are housed in separate buildings away from the work of the ranch. Our accommodations are called a posada or pousada. 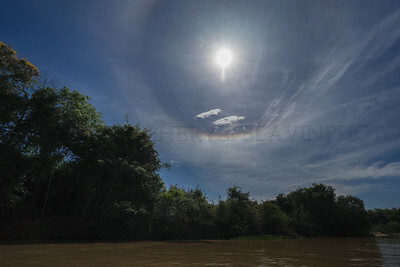 The sun's light is refracted through small ice crystals in the high cirrostratus clouds to create this round rainbow. It was high noon, burning hot and we were heading for lunch. My camera had fallen on day one and was stuck on infinity, f. 7.1, 800 ISO. I could not focus, so I just pointed it and hoped for the best. No one else in my group saw this strange ball in the sky. I did not see the rainbow until I looked at it on my computer. 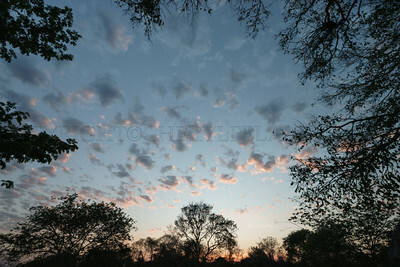 These puffy little clouds lit from below by the rising sun were a treat for me. It was drawn and the world felt new again. This area of Brazil is made up of plateaus and forest as well as savannah. We were staying at a Posada named for the Harpy Eagles we were hoping to see in this area. Each morning we set out in small boats to look for wildlife. The camera I had planned on using for this trip fell and broke the first night in Brazil. It was stuck at F/7.1 and ISO 800, which seemed to work perfectly for dawn and dusk views on the water. 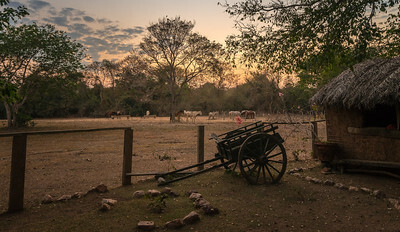 It is so dry during the Pantanal winter that the cowboys or pantaneiros have to move their herds to water. The ranchers create man made water holes to contain enough water to get through the dry season. The cows, , originally from India, are Nelore and are adapted to the dry hard country. They look very skinny and small but that is an adaptation that helps them survive the climate. The fazendas keep a few Holstein type cows for milk and cheese. The Pantanieros themselves still project the romance of our Wild West cowboys. For the time we stayed at the Posada Currupira d'Aras (Harpy Eagle Lodge) I could smell smoke and was finally told there was a fire in the forest on the mountain across the valley from where we were. 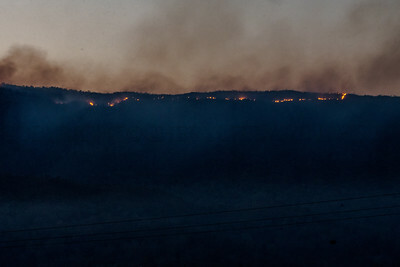 The fire was allowed to burn itself down the mountain. There appeared to be no local anxiety about it.